There are no user reviews for Amazon AWS. Amazon Web Services (AWS) delivers a set of services that together form a reliable, scalable, and inexpensive computing platform 'in the cloud'. These pay-as-you-use cloud computing services include Amazon S3, Amazon EC2, Amazon SimpleDB, Amazon SQS, Amazon FPS, and others. Number of data centers this hosting provider maintains. Since early 2006, Amazon Web Services (AWS) has provided companies of all sizes with an infrastructure web services platform in the cloud. With AWS you can requisition compute power, storage, and other services–gaining access to a suite of elastic IT infrastructure services as your business demands them. With AWS you have the flexibility to choose whichever development platform or programming model makes the most sense for the problems you’re trying to solve. You pay only for what you use, with no up-front expenses or long-term commitments, making AWS the most cost-effective way to deliver your application to your customers and clients. And, with AWS, you can take advantage of Amazon.com’s global computing infrastructure, that is the backbone of Amazon.com’s multi-billion retail business and transactional enterprise whose scalable, reliable, and secure distributed computing infrastructure has been honed for over a decade. Cost-effective. Pay only for what you use, as you use it, with no up-front commitments. As the Amazon Web Services cloud grows, our operations, management and hardware costs shrink, and we pass the savings onto you. Dependable. Utilize a battle-tested, web-scale infrastructure that handles whatever you throw at it. The Amazon Web Services cloud is distributed, secure and resilient, giving you reliability and massive scale. Flexible. Build any application you want using any platform or any programming model. You control the resources you consume and fit them into your application as you see fit. Comprehensive. Don’t start from scratch. 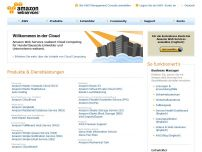 Amazon Web Services gives you a number of services you can incorporate into your applications. From databases to payments, these services help you build great applications cost effectively and with less up-front investment. List of top keywords of this website. "Official Twitter Feed for Amazon Web Services"
Today I'm really excited to show you a powerful new feature of AWS CloudFormation, we're calling Macros. Macros allow developers to extend the native syntax of CloudFormation templates by allowing AWS Lambda powered transformations on templates.